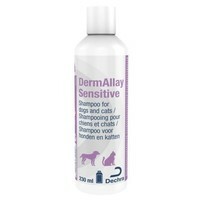 DermAllay Sensitive Shampoo for Cats and Dogs is a fantastic remedy for those pets who suffer from sensitive skin. This gentle coconut shampoo soothes the skin and uses natural fragrances and moisturisers to cleanse the skin and coat, leaving your pet looking beautiful and clean. Suitable for use on puppies, this shampoo is great for cleaning your sensitive pet’s skin, without aggravating or causing irritation like other perfumed shampoos. Suitable for use on puppies.